This blog was co-authored by Elizabeth Tofaris, REAL Centre, University of Cambridge, and Sandra Baxter, Institute of Development Studies, both for the Impact Initiative. 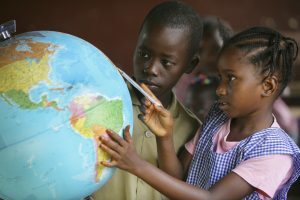 In the lead up to the Global Disability Summit in London on 24 July 2018, a group of 31 donor agencies, international NGOs, research organisations and global education networks have produced a Statement of Action to accelerate equitable and quality inclusive education for children and youth with disabilities. This Statement was drafted at a workshop hosted by the Impact Initiative at the REAL Centre, University of Cambridge, on 26-27 April 2018. Children looking at a globe of the world in a classroom at school. Education in Guinea is free and designed to be compulsory for children aged between seven and 13. Credit: Giacomo Pirozzi/Panos. The Statement promotes a shared vision for a world where persons with disabilities have “equal access to quality inclusive education, which is differentiated to support their learning needs and learning outcomes across each stage of the learning cycle and enables them to lead a fulfilling and independent life”. The Statement is endorsed by the following 31 organisations and networks: AbleChildAfrica, Camfed, CBM, DFID, EENET, Global Campaign for Education, Global Campaign for Education-US, Global March Against Child Labour, Humanity & Inclusion, ICEVI, IDEAS, IDDC, KENTALIS, Leonard Cheshire Disability, Light for the World, Liliane Foundation, MyRight, the Norwegian Association of Disabled (NAD), Oxfam, Palestinian Education Coalition, REAL Centre, Save the Children, Sightsavers, Send My Friend to School, Teacher Creativity Center, The Impact Initiative, The Leprosy Mission, UDPK, UNICEF, University of Birmingham and World Bank Group. DFID, alongside the Government of Kenya and the International Disability Alliance (IDA), is hosting the first Global Disability Summit in London on 24 July 2018 for government ministers, high-level private sector and UN officials, as well as a range of disabled people’s organisations (DPOs) and disability rights activists. The Summit aims to raise global attention on disability inclusion and confirm new global and national commitments to ensuring the rights, freedoms, dignity and inclusion for all persons with disabilities. This is particularly important for education, given that a large proportion of those out of school are children with disabilities. Generate and use robust data and evidence for inclusive planning, programming and for ensuring accountability. Develop, train and support a professional education work force that responds to inclusive education and encourages teachers with disabilities into the profession. Achieve targeted financing and ensure national systems promote the implementation of inclusive education. Reduce barriers to inclusion by adopting a cross-sectoral and life course approach. Involve people with disabilities, their families and DPOs, in partnership with development actors to further the inclusive education agenda. Principles underpinning the Statement of Action have contributed to the Global Disability Summit 2018 Charter for Change. This calls for widespread commitments on a range of themes critical to achieving real change for persons with disabilities, including inclusive quality education for people with disabilities. It commits to “gather and use better data and evidence to understand and address the scale, and nature, of challenges faced by persons with disabilities”. While the Summit is a notable commitment, its legacy will be determined by the impact it has on improving the lives of persons with disabilities. An important step forward will be to generate robust data, both quantitative and qualitative, and make it accessible to a whole range of stakeholders to help them make better-informed decisions. The Statement of Action was created with key input from researchers funded by the UK’s Economic and Social Research Council (ESRC) and Department for International Development (DFID)’s Strategic Partnership. Through their projects, the researchers and their collaborators aim to provide evidence on what governments should consider in order to ensure that children with disabilities benefit from quality education without discrimination or exclusion. Key messages from their research can be found in the collection Research for Policy and Practice: Disability and Education.